As Jacques Derrida wrote in 1995, while considering Archive Fever, nothing is less reliable or less clear today than the word “archive”. Nevertheless, the historic-cultural dimension of the contemporary discursive practices in cinema and art develops in the semantic openendedness of the term, in the repositioning of the idea of archive. The individual disciplines involved in one such field – history of cinema and art, theory of cinema and art, aesthetics, semiotics, philology, etc. – begin to open up to questioning the notion of archive even ‘in negative’: in other words what – after Michel Foucault – the “archive” is not, or does not seem to be. The “archive” is not the ‘library of libraries’ or ‘encyclopedia’, it is not ‘memory’, it is not museum, it is not a ‘database’. In recent years, the attention focused on such ideas has not so much highlighted the ‘impulses’, ‘turns’ and specific forms of art (“art archive”) as it has revealed in many ways how the “archive” concerns us in the interrelation of aesthetic, political, ethical and legal levels among various disciplinary fields. Francesco Federici studied Cinema and Visual Arts in Pisa, Venezia and Utrecht and is now a Ph.D candidate in Audiovisual Studies at the University of Udine, in collaboration with Université Sorbonne Nouvelle – Paris 3. His research and his artistic practice are focused on the relationship between cinema, video art and spectatorship issues. On this topic he has recently edited Cinéma : immersivité, surface, exposition (2013, with Cosetta Saba). Cosetta G. Saba is Associate Professor of Film Studies at the University of Udine, where she teaches Film Analysis and Audiovisual Practices in Media Art. Her research is focused on the relations among experimental cinema, video art, media art and on the practises of documentation, restoration, dissemination and access to the audiovisual artworks. 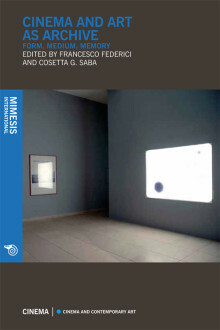 Among her books: Preserving and Exhibiting Media Art: Challenges and Perspectives (2013, edited with Julia Noordegraaf, Vinzenz Hediger, Barbara Le Maître) and Archivio Cinema Arte (2013).